The brow and forehead are frequently a central focus of patients seeking facial rejuvenation. Sun damage can significantly impact these areas and result in an aged or tired appearance, or even contribute to functional problems such as visual field obstruction. The rejuvenation of these areas is a critical part in the restoration of facial harmony and the reestablishment of a more youthful appearance. 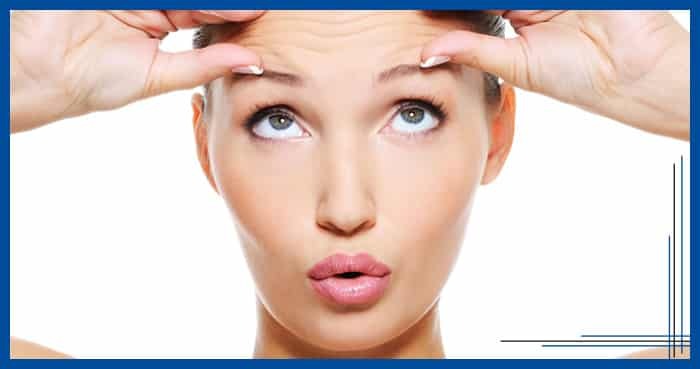 In a brow lift, the muscles and tissues that cause the drooping are removed or altered to smoothen the forehead, raise the eyebrows and minimize frown lines. Dr. Schenden may use the conventional surgical method, in which the incision is hidden just behind the hairline; or it may be performed with the use of an endoscope, a viewing instrument that allows the procedure to be performed with minimal incisions. Both techniques achieve similar outcome -- smoother forehead skin and a more animated appearance. Whereas the focus of rejuvenation in the past was focused mainly on the face and neck, it has now become widely recognized that rejuvenation of the forehead is essential to produce a natural, well-balanced result. There is now greater emphasis on minimizing incisions and long-term side effects, such as numbness, while achieving a superior aesthetic outcome with improved patient satisfaction. Less invasive techniques have also emerged. The main complaint of a patient with forehead aging is the frown lines. These wrinkles bestow a tired and perturbed appearance. Although these patients may not be truly angry or unhappy, they are commonly perceived as upset. Our brow lift surgical approach will achieve the facial rejuvenation that compliments the face and neck. A forehead lift is most commonly performed in patients between the ages of 40-80 years old to minimize the visible effects of aging. However, it can also help people of any age who have developed furrows or frown lines due to stress or muscle activity. Individuals with inherited conditions, such as a low, heavy brow or furrowed lines above the nose can achieve a more alert and refreshed look with this procedure. During your consultation, Dr. Schenden will first evaluate your face, including the skin and underlying bone. He will discuss your goals for the surgery and ask you about certain medical conditions that could cause problems during or after the procedure, such as uncontrolled high blood pressure, blood-clotting problems, or the tendency to develop large scars. Be sure to tell the surgeon if you have had previous facial surgery, if you smoke, or if you take any drugs or medications -- including aspirin or other drugs that affect clotting. If your hair is very short, you may wish to let it grow out before surgery, so that it's long enough to hide the scars while they heal. Detailed instructions on activity before and after surgery will be discussed. Your surgeon will give you specific instructions to prepare for the procedure, including guidelines on diet, medications, activity level, and smoking. Carefully following these instructions will help your surgery and your recovery proceed more smoothly. If you smoke, plan to quit at least 4-6 weeks before the scheduled surgery otherwise an increased risk for infection and wound healing will occur. Avoid sun exposure before and after surgery as this may interfere with your scar. Patient preference will be incorporated into this decision. We have the option of outpatient or inpatient surgery. The facilities we are privileged to operate from include Columbia Surgery Center (our private surgical suite) and William Beaumont Hospital of Troy, MI where Dr. Schenden is currently Chief of Plastic Surgery. General Anesthesia or IV Sedation with local (twilight anesthesia) depending on surgeon and patient preference. Dr. Schenden will help you decide which surgical approach will best achieve your cosmetic goals: the minimal-invasive brow lift (open approach) or the endoscopic brow lift. Make sure you understand the technique and reasoning for the best option being recommended to you by your surgeon at the consultation. Special considerations will be taken for concealing the scar in patients who are balding or have thinning hair. In typical patients, 2-3 cm incisions are placed behind the hairline. Scars are placed in concealed locations within the hair and are not visible. The eyebrows are elevated and excess skin at the incision point will be trimmed away to help create a smoother, more youthful appearance. The incision is then closed with stitches. The endoscopic brow lift: requires the same preparation as the minimal-invasive open approach. 3-5 short scalp incisions are made to access the brow muscles. An endoscope, which is a pencil-like camera device connected to a television monitor, is inserted through one of the incisions, allowing the surgeon to have a clear view of the muscles and tissues beneath the skin. Using another instrument inserted through a different incision, the forehead skin is lifted and the muscles and underlying tissues are removed or altered to produce a smoother appearance. The eyebrows may also be lifted and secured into their higher position. Brow lift usually takes 2-3 hours, depending on complexity or combination with additional surgeries such as eyelid surgery. During the immediate postoperative experience, numbness and temporary discomfort around the incision may occur but easily controlled with prescription medications. Patients who are prone to headaches may be treated with an additional longer-acting local anesthesia during surgery as a preventive measure. Head elevation for 5-7 days following surgery will significantly assist in lowering your swelling during recovery. Swelling may also affect the cheeks and eyes but this should begin to disappear in 1-2 weeks. The stitches are usually removed at 7-10 days. Detailed wound care and activity instructions will be discussed at your consultation. Normally you may return to work after 2 weeks but with light duty and no heavy lifting or strenuous activity for 6 weeks. Swelling is expected with the majority of the swelling will improve within the first 4 weeks after surgery. Expect the final outcome of the brow lift at 3-6 months after surgery. Most patients are pleased with the results of a brow lift, no matter which surgical method was used. Often, patients don't realize how much their drooping brow contributed to the signs of aging until they see how much younger and more rested they appear after the lift. Although a brow lift does not stop the clock, it can minimize the appearance of aging for years. Every surgical procedure involves a certain amount of risk and it is important that you understand these risks and the possible complications associated with them. In addition, every procedure has limitations. An individual’s choice to undergo a surgical procedure is based on the comparison of the risk to potential benefit. Although the majority of patients do not experience complications, you should discuss them with your plastic surgeon to make sure you understand all possible consequences of brow lift.